Do you bemoan the fact that televisions ever moved from the old squarish 4:3 aspect ratio to the wider 16:9 HDTV standard? Do you regard my series of blog posts about Constant Image Height home theater with derision? (At least one of our readers sure does.) Do you take videos on your phone in Portrait format? 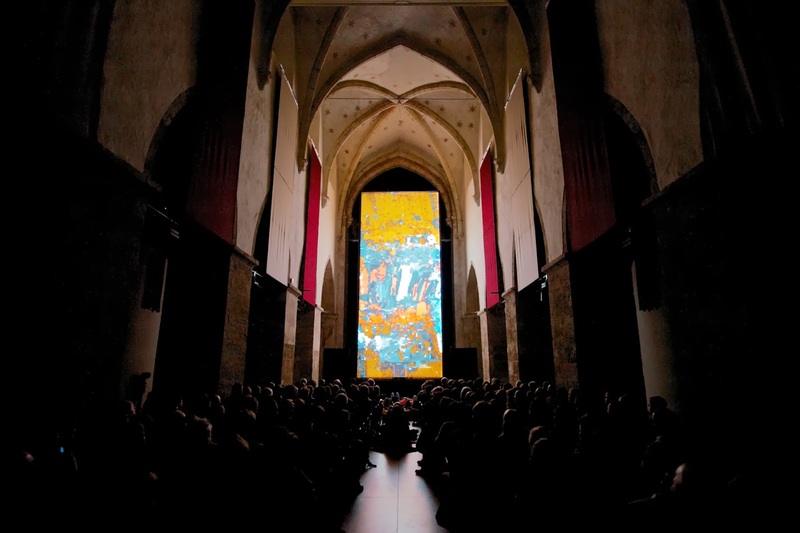 If so, a new cinema art exhibit in Europe may be right up your (very narrow) alley. 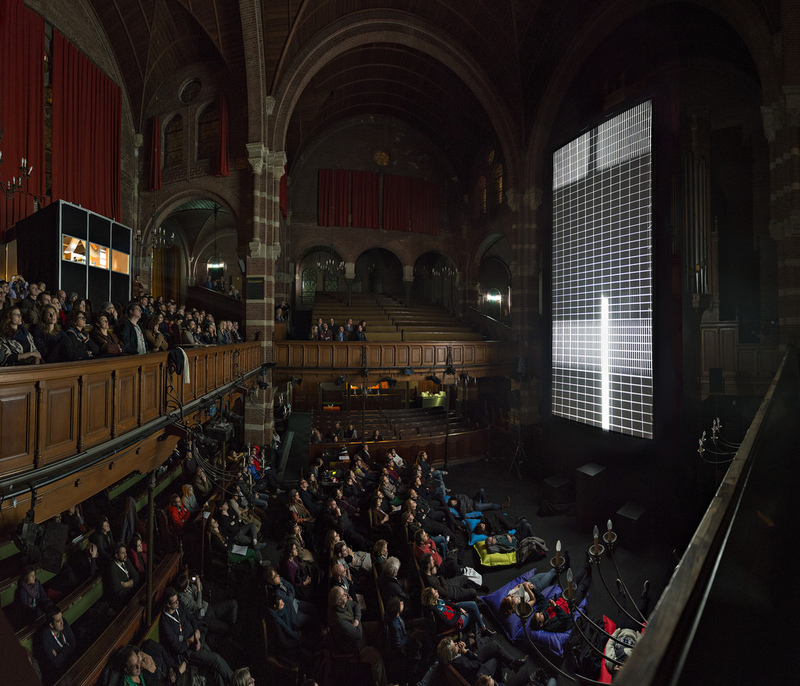 For the project called “Vertical Cinema,” a group of artists have created a travelling festival for films photographed in a narrow yet tall aspect ratio, projected onto special screens installed from floor to ceiling in venues such as churches and nightclubs. It’s sort of like IMAX, but more awkward and less immersive. 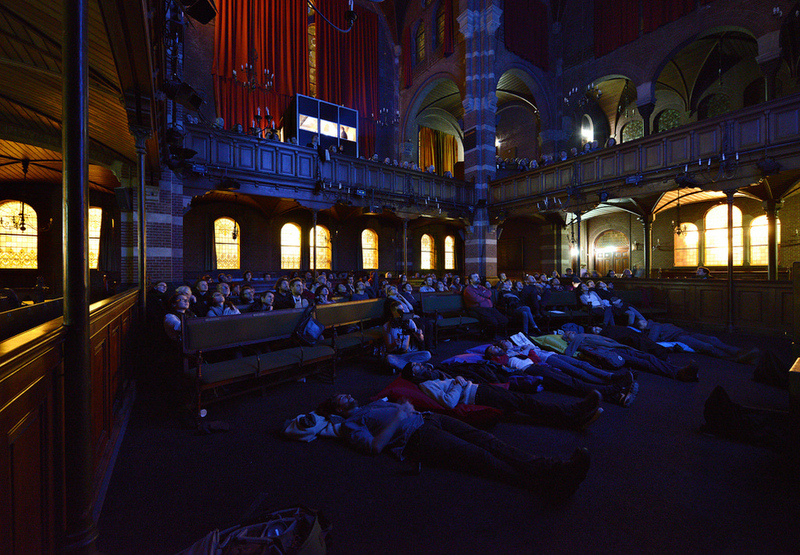 The viewing angle is so severe that some members of the audience need to lie on the floor to look up at the screen. Yup, sounds like artist-speak to me. The films commissioned are mostly avant-garde shorts comprised of abstract images, so don’t go expecting Hollywood to adopt this for the next sci-fi blockbuster franchise. This of course begs the question of why movies ever transitioned from the 1.37:1 Academy Ratio used up through the early 1950s to widescreen in the first place. Skeptics will complain that CinemaScope was designed as a gimmick to lure audiences back to theaters and away from their televisions. Of course it was. What of it? It also happens to be a more natural way for viewers to take in moving pictures. Human beings have evolved with two eyes arranged horizontally on our faces. Our field of vision is naturally wider than tall, and we typically scan our environment from side to side. Projected images that exceed our vertical field of view require us to scan up and down, which is much less comfortable. Obviously, the artists behind Vertical Cinema aren’t interested in natural or comfortable viewing. The format is designed to be confrontational. However, other than inspiring reactions of, “Huh. That just looks wrong,” I don’t see much point in it. As far as cinema format gimmicks go, I’d be much more interested in ScreenX. Were it not for Todd-AO 70mm, Panavision 70mm, Super Technirama 70 and VistaVision, Josh I would share your skepticism. Take a good, long look at the rarely-seen Michaelangelo documentary at the opening of The 1965 Agony and the Ecstasy Blu Ray. Local Theatre customers were denied its glory at the time! I’m not sure I understand your point. The 70mm formats all had an aspect ratio of 2.20:1 – very close to 2.35:1. VistaVision was designed to be projected anywhere from 1.66:1 to 2.0:1. That was still certainly a widescreen format. The Agony and the Ecstasy was shot in 70mm. I truthfully think that it is time for Cinerama to make a comeback. With digital projection and the fact that formats like LieMax already use dual projectors, doing Cinerama with modern digital technology should be extreamely easy, and would create an experience that cannot be reproduced at the home. As for this vertical cinematography, that is indeed stupid. It does not create an immersive exerieance, and if you want something that completely fills your perephial vision, Omni Theaters (aka ImaxDomes) are available in science musuems in many major cities. But leave it to the Europeans to embrace this. If someone says something is art, it is considered hugely politically incorrect to disagree with them. So some modern art musuem will probably spend millions to build special rooms to house these screens to show these “movies” so that future generations can experience them, because it is labled as “art”. The only place vertical displays are practical is when displaying text – ie programmers, legal secutaries, and airports. While on the topic of aspect ratios; How would you recommend that a movie with wildly different aspect ratios should be encoded on a blu-ray? Something like Elvis on Tour, for example, where the aspect varies from about 1.5:1 to about 3.2:1. The movie was released in 2.35:1, with everything placed within the 2.35:1 frame, either letterboxing or pillarboxing the image, depending on the ratio of the current image. If released on blu-ray, should this movie keep its 2.35 ratio, or should they optimize for a 16:9 screen (filling the height of the image for sequences that are narrower than 16:9, and the width for sequences wider than 16:9) to avoid windowboxing? errrr. Ain’t that typical. Elvis on Tour has actually been released on blu-ray 🙂 Wonder why I couldn’t find it when I searched for it a month or so ago… Anyway – regardless of what they did with the blu-ray, the question still stands, though. What’s the best way to present a movie like this, do you think? I haven’t seen that movie. Is one ratio more dominant than the others? You couldn’t find it a month ago? That’s beyond strange! I bought the ‘Elvis On Tour’ Blu-ray two years ago for my father. It surprises me how many BluRays are artificially modified so there are no black bars at the top and bottom of the screen. One of the main reason many of us switched to DVD was to get away from the dreaded Pan & Scan of our youth. Are you talking about movies that have been opened up from 1.85:1 to 1.78:1? The difference there is so negligible that no filmmaker has ever complained about it. Cropping movies from 2.40:1 to 1.78:1 is not particularly common on Blu-ray. Guess I was under the impression because it happens much more on services like Netflix. Maybe not so much on BluRay which is another reason , I buy the movies I really love. At current date the most irritating thing to me about aspect ratios is when watching tv networks. If done right, their signal would vary ARs all the time and you would not have to screw with the tv settings to get it right. The receiver box should be aware of the AR of the display device and modify the output accordingly. Our local network channels are still stuck in blown up/fixed 4:3 unless you watch the HD feed of the given show. I have seen channels like trutv often times put the image in the center of the screen. Even on a 4:3 tv, the 4:3 tv show is in a tiny box in the center of the screen with black borders on all sides. Wtf? I do not think I could be comfortable laying down to watch a movie – and I am quite sure the audio will suffer in doing so. Sorry Josh, I was still groggy when I posted Tuesday a.m. And I would say A-men to William Henley’s suggestion about Cinerama! Forgot to mention that I watched Gunfight at the OK Corral (VistaVision) Thursday on my Plasma with my pet Boston Terrier Zippy who usually has a very limited attention span. He was enthralled by my new Blu Ray. When I was 10 years old, it was one of my favorites. Not sure if VistaVision has anything to do with it!